With Mother’s Day celebrated earlier this month, our thoughts turn to the mothers in our lives and how we can make their lives better just as they’ve spent their lives helping us. Perhaps mom isn’t as independent as she used to be. Maybe she’s having some trouble with her daily activities. Or, perhaps the stress and burden of home ownership is too much for her. Whatever the reason, it may be time to look at senior living options to make mom’s life the best that it can be. But sometimes, mom may have some resistance to the idea of living in a supportive environment like John Knox Village East. Below are some ideas help make mom a bit more receptive to the idea. 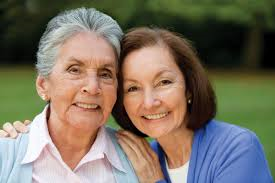 Talk with mom about the options that exist for her senior living options. Sometimes, mom hears “senior living” and immediately thinks nursing home, retirement home or assisted living…that may not be what she needs. Mom may just need a maintenance free senior living community that gives her the help and support to make her life easier. Also, don’t just spring the idea of moving on her. Stress to mom that her health and well-being are your primary concerns. Explain that it will be easier to move now while she’s relatively healthy, rather than waiting until her health declines further. Review her options and give her time to warm up to the idea. Share with her that the lifestyle and healthcare provided at a senior living community can keep her independent longer than remaining in her family house. Be sure and do your homework. Research communities, talk with family and friends that have loved ones living at the communities you’re looking at. Find out what they like about living in their senior living community. Visit a handful of preferred options to give mom some communities to compare. Take notes and highlight pros and cons of each option. Go with mom on community tours so that her questions are answered and so are yours. Pair mom up with a resident that she may know at a community who can answer her questions. Focus on facts to dispel mom’s perceptions of what a senior living community may be like. She may have a perception that it’s an old-folks home and they sit around and play bingo. Talk with your senior living counselor at each community. Find out what activities they provide and what mom may find the most appealing. If she likes quilting, find out what options are available for engaging in that activity. If mom enjoys volunteering, find out available opportunities that each community has to fulfill this passion. Find out if the retirement communities you’re looking at offer opportunities for mom to attend activities or even stay a few days to help her make a decision. This is a prime opportunity for mom and you to find out what it’s like to live at the community. She can participate in activities, enjoy meals, see what the housekeeping is like and really “test-drive” the community prior to moving in. These activities will help you and mom find the perfect senior apartment for her. Call us at 660-584-4416 to find out more about how we can help make your mom’s life the best that it can be. We can give her and you peace of mind, increase her involvement and give her the help she needs to manage her daily life.